It's the real world. But it's not the world that most people think it is. Ghosts haunt old houses. Strange creatures roam the wilderness areas of our world. UFOs fly in our skies, mutilate cattle, and abduct humans for mysterious medical experiments. People live among us who can move objects with their minds, read thoughts and emotions, and even leave their own bodies to travel invisibly. And yes, there are real magicians out there, mages who use elaborate rituals and meditation to cast spells and cause change in our world. You're a paranormal investigator. You have a day job, like everyone else, but at night you investigate the mysteries of our world and try to gather proof of the paranormal. You use every means at your disposal to prove, beyond doubt, that the paranormal is real. Using both science and metaphysics as tools, you are part of an elite team that is dedicated to solving these mysteries. You are a member of the Foundation for Paranormal Investigation. 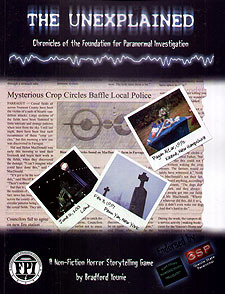 The Unexplained is both an exciting game of dynamic storytelling and a non-fiction book about the paranormal. Build thrilling stories about paranormal investigation while using the real resources to help you play the characters to their best. "We do feel this is also not just a game but a learning tool..."
- East Coast Transcommunication Organization.